This is the first chapter of a series of posts about my experience working with the open-source application, Blender. I'll spend at least 30 minutes every day over a period of 8 weeks working directly with Blender and I'll post my discoveries, links and ideas at least once a week. An interesting style trend has been appearing since 2016 - low poly. You see this look in advertising, short films and even in self-portraits. What exactly is low poly? If you take it literally, it means fewer polygons. Fewer polygons mean a rougher more triangulated faces for models. Game creators have been using low-poly modeling for years because fewer polygons mean easier modeling and faster rendering both in the 3D app and the game engine. 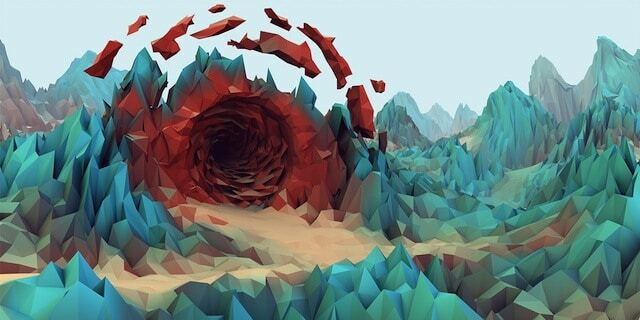 Now, low poly has become an aesthetic all its own. The look is a cross between paper models and 2D cartoons but with a unique style all its own. Characters can also be created using the low-poly style. It's a bit more complex, but certainly not as difficult as creating/sculpting a realistic 3D character. Most of the tutorials I found started with a sketch of the character and the workflow consisted of using extrude to create polygons to transform the 2D into a low poly 3D version. Grant Abbitt's tutorial on creating a low-poly person is perfect for creating a simple character model. There are literally dozens more, so feel free to do your own research to find an instructor who clicks with you. Once you learn the technique, you can expand to work on your own unique characters including animals! Still working on memorizing all of the keyboard shortcuts in Blender and understanding the difference between object mode and edit mode. I did, however, make it through the rarely written tutorial on creating a simple low-poly landscape of mountains, clouds and trees. Karan Shah's Envanto tuts tutorial: Secrets to Creating Low Poly Illustrations in Blender is an excellent method for learning how to use Blender for low-poly. Great illustrations, clear instructions and a simple workflow. It will need work on rendering and lighting, but that will come later. There are tons of possibilities for low-poly both in scene creation, portraits and even animation. I think the look is just right for a short horror animation. Perhaps I'll do one myself!